The new monsignors of the archdiocese. Click for a larger version. Pope Benedict XVI has honored four priests and one recently deceased priest of the Archdiocese of Indianapolis by naming them monsignors. Father Paul Richart, administrator of St. Paul Parish in Sellersburg; retired Father Joseph Riedman; Father William Stumpf, moderator of the curia; Father Anthony Volz, pastor of St. Barnabas Parish in Indianapolis; and Father Joseph Kern, who died on April 16, received the honor. 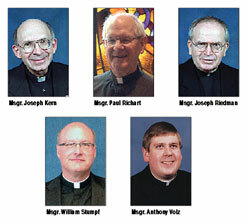 Pope Benedict named Father Kern a monsignor just five days before the late dean of the Terre Haute Deanery died. All of the priests still living who were named monsignors said they were surprised when they learned of the honor, none perhaps more so than Msgr. Riedman. Father Volz also reacted with a dose of humility when Bishop Christopher J. Coyne, auxiliary bishop and vicar general, called to tell him the news. Part of the humility, which the other new monsignors also experienced when they were told about the pope honoring them, came about in part because they know so well how much other people in their lives made them into the priests that they are today. Some of those people are their brother priests. 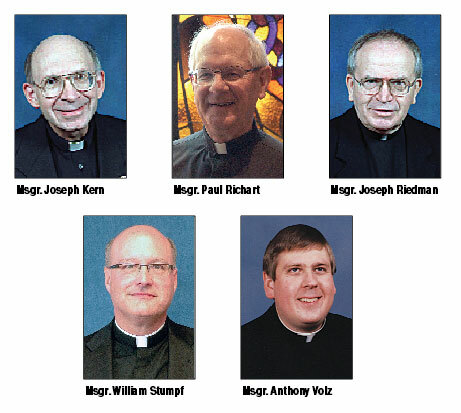 Of the various priests who influenced Msgr. Stumpf, he cited Father Paul Shikany, pastor of St. Matthew the Apostle Parish in Indianapolis, in particular. “[He] was a young priest when I was in seminary and really made a big impact on my life, and helped me to feel comfortable,” Msgr. Stumpf said. One of the priests that Msgr. Richart looked up to when he was a seminarian was the late Msgr. Kern. They both grew up in St. Philip Neri Parish in Indianapolis, and knew each other while they were in formation for the priesthood at Saint Meinrad Seminary in the 1950s. Msgr. Kern was four years older than Msgr. Richart. Msgr. Volz also knew him as a seminarian in the 1980s when Msgr. Kern was ministering at St. Michael Parish in Cannelton, St. Paul Parish in Tell City and St. Pius V Parish in Troy. Later, he appreciated his help when Msgr. Volz served as a pastor for the first time when he was assigned to Sacred Heart of Jesus Parish in Terre Haute in 1990. Msgr. Kern had already ministered in that deanery for nearly a decade. Bishop Coyne echoed the comments of the monsignors about their brother priests. All the living priests named monsignors also said that their honor was due in part to the help given to them over the years by the lay Catholics they have ministered to and with. Msgr. Riedman said that he and the other priests being named monsignors is a gift to the entire Church in central and southern Indiana. The ecclesiastical title of monsignor is an honor given to priests by the pope. It does not give priests who receive it any additional authority or duty in the Church.